Geospatial information — an amalgam of data on an object’s location and attributes — is gaining increased attention beyond its traditional home in geographic information systems (GIS) communities. When integrated with active devices and sensors, geospatial technologies are transforming the way people work, move, live and — thanks to geocaching, fitness apps and Pokémon Go — play. Companies can use GIS and internet of things technologies to combine a device’s location with its status and other important information. For example, information such as the position of a valve or the setting of a switch can be displayed on a map that provides context at macro levels while enabling users to drill down to high levels of detail. The approach delivers key inputs to support informed decisions and efficient business processes. The geospatial industry has used IoT concepts for decades. Networks of GPS receivers use the internet to share and distribute data to produce accurate positioning in real time. The information can be accessed using wired or wireless internet connections, dedicated networks or satellite downlinks. Spatial information — location together with the velocity and direction of any motion — provides key inputs for a wide variety of applications. Precise GPS data can be combined with readings from optical instruments and geotechnical sensors to monitor motion in buildings, infrastructure and geologic hazards in real time. Using this approach, teams can continuously monitor structures adjacent to a construction site. If the structures move or subside, key personnel are immediately alerted to mitigate the problem. In many situations using IoT, knowing where a device is located is as important as knowing its status. As an example, knowing the true location of a water pressure sensor or flow meter helps when diagnosing problems in a water distribution network. When customers call to report outages or leaks, a water utility can combine customer addresses with locations and readings of assets in the area. The data helps the utility to pinpoint likely trouble spots and dispatch crews for maintenance and repairs. Work orders tied to in-vehicle GPS can even enable crews to navigate to the site. In many cases, remotely controlled assets can operate valves and switches to mitigate or bypass a problem. 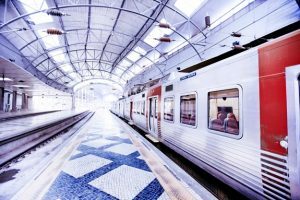 On-board sensors for status and positioning help increase safety and efficiency in rail transportation. Spatial information also plays a role in keeping things moving safely and efficiently. Sensors on trains and tracks enable railway operators to manage the location and spacing of trains, effectively increasing capacity without adding more track or railcars. On long-haul trucks, networks of IoT sensors can track vehicle location, mechanical systems and condition of cargo, as well as monitor driver habits and performance. Information such as fluid levels, temperatures and throttle positions can be collected and sent to fleet operators in real time. Accurate position data adds value and efficiency to asset management. 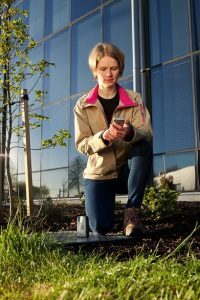 Using her smartphone and standalone GPS receiver, a technician can easily collect and share utility information. By knowing and managing location and status data, the GPS-enabled IoT supports asset management on construction sites. Contractors can track the location of assets on a job site (i.e., machinery and heavy equipment) to ensure that all gear is accounted for. Assets can be “geofenced,” a function that can alert owners if equipment unintentionally leaves a job site through theft or operator error. It’s also possible to remotely disable or shut down equipment that strays from designated locations. Precision agriculture uses interconnected sensors, analysis and control systems to reduce costs and increase farm productivity. Geospatial systems and IoT extends to agriculture as well. GPS positioning tied to yield and moisture monitors provides detailed data for mapping and analysis of crop harvests and field performance. The information is used to automatically control machines to optimize the application of seed and soil additives. 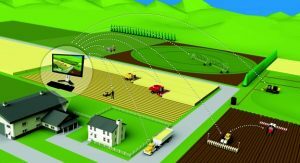 The interconnected sensors and control systems have opened the door for self-steering and autonomous farm machinery. The use of positioning in IoT solutions will continue to expand. Today, geospatial manufacturers provide a broad range of software development kits, configurable systems and standalone GPS receivers that can support specialization, bring your own device options and third-party solutions. As positioning gains more traction in the IoT, geospatial information will play a significant role in user interaction and operational decisions at multiple levels and locations.